Essential during periods of cold weather, Finessence Organic Eucalyptus Radiata Essential Oil will be your best ally to fight against winter ailments such as stuffy nose, colds and other discomforts. Thanks to its fresh smell, it helps to unclutter the airways. It supports the immune system and allows faster healing. Stimulating, it tones and invigorates the mind thanks to its energizing virtues. It is an excellent mental tonic that helps concentration and promotes memory. 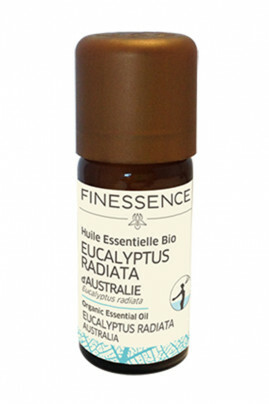 Anti-infectious and antiviral, Finessence Organic Eucalyptus Radiata Essential Oil has it all! Cosmetics : In a spoonful of vegetable oil such, add 3 to 4 drops of essential oil. No more stuffy nose with Eucalyptus essential oil! Eucalyptus radiata (eucalyptus) leaf/stem oil, linalool*, limonene*, citral*, geraniol*, citronellol*. Contains: limonene, beta-pinene, alpha-pinene, citral. May cause an allergic skin reaction. Flammable liquid and vapour. Causes skin irritation. Cause serious eye irritation. May be fatal if swallowed and enters airways. Very toxic to aquatic life with long lasting effects.